According to the commander of the Northern Fleet, Nikolay Evmenov, the Tula submarine of the Project 667BDRM/Delta IV class will stay in service until 2029 (as will be the Gepard submarine of the Project 971 class). It's not clear why Tula was singled out - it is not the last submarine to complete overhaul. After Tula left Zvezdochka in December 2017, its place was taken by Bryansk. It appears that Tula will be one of the last Project 667BDRM submarines to be withdrawn - according to Evmenov, Project 955 Borey and Project 885 Yasen submarines will form the backbone of the Russian submarine fleet in 2030. It was difficult to expect that the briefing organized by the Russian Ministry of Defense about a month ago would be taken seriously by the commentariat (especially in the United States) and indeed it wasn't. Yes, they didn't show the missile, only the container. The launcher that was demonstrated to participants was not exactly the one that was shown on the slide. And, oh, the horror, no questions were allowed. On top of that, MoD doesn't exactly have a stellar record of keeping its facts straight (to put it very mildly). So there is every reason to be skeptical about anything MoD said. However, the briefing confirmed what I've been saying all along - this whole discussion needs to be more transparent and the more information we have the better. The briefing prompted the United States to put together a rebuttal of sorts. Of course, this was done in the US tradition - "our secret internal assessment confirmed that [surprise, surprise] we are right, but we will not tell you why and how dare you not to trust the US intelligence community?" This is very much the thrust of the article "U.S. Intelligence: Russia Tried to Con the World With Bogus Missile", in which Ankit Panda got some really interesting new information out of the US intelligence community. Perhaps inadvertently that information raised a few questions about whether US story about Russian violation is as consistent as the United States wanted us to believe. So, here is what we have learned. the Central Intelligence Agency and the National Geospatial Intelligence Agency have now "determined that the cruise missile canisters and launch vehicle the Russian Ministry of Defense publicly showed at the briefing were not related to the missile that the United States has argued since 2014 violates the 1987 treaty." "the treaty-violating missile is larger than the canister shown publicly by the Russian Ministry of Defense and uses a separate launch vehicle" and "the United States assesses the SSC-8 to be a road-mobile variant of the Kalibr sea-launched cruise missile." That was not quite the argument that the United States has made so far. Or, more precisely, this fits some parts of the story, but doesn't quite fit all of them. It is possible to come up with a theory that is reasonably compatible with what is known publicly known, although this theory does rely on an assumption that the United States got one key piece of evidence wrong. It's difficult to tell how likely it is, but I see no reason why this should be ruled it out, especially since it would explain quite a bit. At this point the designations that are normally used in this discussion - SSC-8, 9M729, Kalibr - are not particularly helpful. To avoid confusion, I will use different designations to refer to cruise missiles under discussion and then will try to see if we could establish a link between the two sets. U.S. theory of the violation, outlined in a statement by DNI Coats, begins with the fact that Russia tested a certain cruise missile from a fixed launcher. That missile, CM-1, was tested at least six times and "the longest test of the six saw the missile fly to a range of 2,070 km." It would be a logical conclusion that this CM-1 missile is very close to the Kalibr SLCM - it has roughly the same range, it was developed by the same Novator design bureau and so on - there are only so many cruise missiles one design bureau can develop. The next step in the U.S. assessment is that some missile, call it CM-2, was tested from a road-mobile launcher (as I understand, after that series of CM-1 tests was completed). We know that CM-2 was never tested to the INF range (i.e. to 500+ km). The United States also claims that CM-2 has been already deployed - the most recent estimate is that four battalions are equipped with missiles of this type. On top of that, there is a third missile - the one that was shown by the MoD at that briefing in January. Let's call it CM-3. Russia said that this missile was never tested to the INF range and that it is therefore fully compliant with the treaty. As far as I can tell, Russia did not dispute that the missile demonstrated during the briefing has been already deployed. By looking at all this we can reasonably conclude that CM-2 and CM-3 look like the same missile - both were tested from a mobile launcher at the same site (the 5-km circle with the center at 48.774, 46.31 - this looks like the information that the United States gave Russia to identify the test site), neither was tested to the INF range, both missiles have been already deployed. Russia says that CM-3 is 9M729, which is a version of Iskander/9M728/SSC-7. The "CM-2 is CM-3 is 9M729" theory also has quite a bit of support in various U.S. statements. At some point, U.S. officials assured Hans Kristensen that the missile Russia developed and deployed - I will continue to call it CM-2 at this point - is a derivative of 9M728/SSC-7 and that the its launcher has a characteristic "hump" that distinguishes it from that of 9M728/SSC-7. Also, a New York Times story interviewed General Breedlove, who said that "location and verification [is] really tough" since "the mobile launcher for the cruise missile [CM-2] closely resembles the mobile launcher used for the Iskander." This perfectly fits the "CM-2 is CM-3 is 9M729" theory as the "hump," is not easy to see on satellite images and in all other respects the CM-3 launcher does look very much like that of 9M728/SSC-7. What the U.S. intelligence is telling us now is that the "CM-2 is CM-3 is 9M729" theory is wrong. The crucial link in the U.S. assessment is that CM-2 is the same CM-1 missile that was tested to the INF range, albeit from a fixed launcher. This is exactly what makes it a violation of the INF treaty. The "CM-2 is CM-1" theory, however, has a few problems. One is the claim that CM-1 is larger than the container that Russia showed. Since CM-1 is also assessed to be a variant of Kalibr, it is safe to assume that it's an about 8-meter missile. Since this theory assumes that "CM-2 is CM-1" and the United States still insists that CM-2 has been already deployed, it would need a larger launcher as well. That doesn't quite fit General Breedlove's statement about CM-2 launchers closely resembling the Iskander one. If the "hump" is indeed not easy to see, telling a launcher that can accommodate a 8-meter missile from the one that carries a 6-meter 9M729/SSC-7 should not be that big of a problem. In any event, nobody has seen that larger launcher anywhere. The problem, of course, is that the assessment that the missile tested from a fixed launcher [CM-1] is exactly the one that was later tested and deployed on a road-mobile launcher [CM-2] is the key link in U.S. accusations. If that link is removed, there is no case anymore. And in my view, all pieces fit together much better if that link is removed. The missile (well, the container of) that Russia showed in January [CM-3] is indeed 9M279, it is a variant of 9M728/SSC-7, and it may well be treaty compliant. The United States correctly identified it as such and determined that this missile, CM-2, is 9M729. But it appears that this missile has nothing to do with whatever Russia tested from a fixed launcher [CM-1]. That missile definitely exists, but it's just a different missile. Of course, saying that this whole thing is a case of mistaken identity is an extremely steep assumption. I should be careful to say that I don't believe we can assume that. But in my view it is a possibility that we need to consider. The truth is we don't know how that link was made and to what extent we can trust it. We know that the U.S. intelligence community has "high confidence" in its conclusion, but that's about it. People who have seen the evidence swear that it is rock solid. It may well be. If it is, the United States should show it - secrecy at this point is counterproductive and increasingly makes it look like the United States is changing its theory of violation as it goes along. In any event, feel free to chime in here on on Twitter if you believe that I missed something of if you have information that would support one theory or the other. According to US sources, quoted by CNBC, Russia conducted a test of the Nudol ASAT system on December 23, 2018. The missile was launched from a mobile launcher from a test site in Plesetsk. The launch complex used to test the Nudol missile was found near the site used for Thyklon space launches. That would be the second Nudol test in 2018 - the first one took place in April 2018. CNBC also quotes a source as saying that it was "the seventh overall test of the system." There were indeed three launches in 2014-2015 (one of them unsuccessful) and two in 2016 - in May and in December. Apparently there were no launches in 2017. 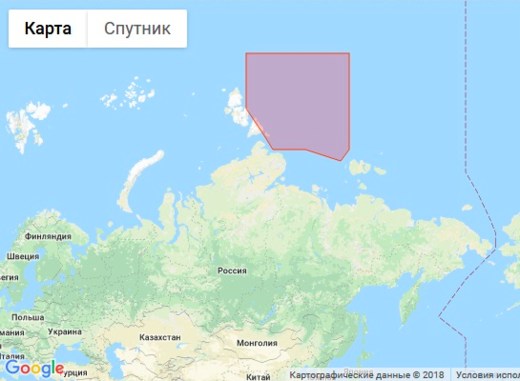 In the December 2018 test, the missile was said to be in flight for 17 minutes and landed at 3000 km (1,864 miles in the CBNC report) from Plesetsk. 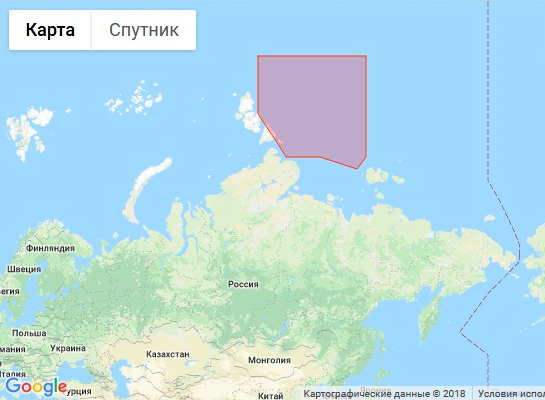 This matches the splash-down area in the Laptev Sea that was closed during the 23-25 December 2018. A similar area was closed for the April 2018 test. I should also note that it appears that Nudol tests are not included in the Roskosmos launch statistics - if they were, the total count would be three launches from Plesetsk in 2018 - one Yars in June and two Nudols. But Rogozin counted only two. The issue of why the table doesn't include naval missiles (like Kalibr SLCM) is one of the most interesting questions raised by the briefing (at least in my view). It appears that there is no "naval" division at Kapustin Yar. But Kalibr must have been tested somewhere. It's probably not Nenoksa - that is an NPOmash test site and I am told that tests to more than 220 km from there are very rare. December 2018 was the first time in a while when the Rocket Forces made no announcement of the missile launch plans for the upcoming year and said nothing about the number of missile launches conducted in the year that is ending. Maybe it's because these announcements were getting a bit embarrassing - normally the Rocket Forces would conduct about half of the planned launches (this old chart provides a good illustration). The story repeated itself in 2018 - in December 2017, Sergey Karakayev, the commander of the Rocket Forces, announced that his service will conduct 12 launches in 2018. The actual number appears to be closer to two. Counting missile launches in 2018 is not easy - there was virtually no official information this year. There were three official statements - in October 2018, the press quoted the ministry of defense as saying that the Air and Space Forces conducted three launches since December 2017 - two Sarmat ejection tests (in March 2018 and in May 2018 and a test of a Yars missile - apparently the one in June 2018 (no information was released at the time). Then, at the end of December, Dmitry Rogozin tweeted that Roskosmos conducted 22 launches in 2018. Most of these were space launches, but two out of eight launches from Plesetsk were not. We know that one of them was the Yars launch in June 2018, but the identity of the second one is more difficult to establish. There are a number of candidates. First is the test of Nudol ASAT system that took place in March 2018. I am not entirely certain that this would be something Roskosmos would take credit for, but colleagues tell me that since it was a suborbital launch it's a Roskosmos territory. But it probably shouldn't count as a Rocket Forces launch. In the past, RVSN did not take credit for Nudol tests. Other candidates for that second launch from Plesetsk are the event that was expected to take place during the October 2018 strategic exercise. A NOTAM warning was released, but nothing happened. Or maybe it did, but it went unannounced. Sounds possible, but more likely the test was postponed. Something similar happened in December 2018 - Russia released a NOTAM that covered December 23-25, but no launch was reported. I would judge that it is also unlikely that it was an actual launch. So, unless more information about ICBM comes out, I will count the March 2018 Nudol test as the second Plesetsk launch. There were launches outside of Plesetsk, of course. It was difficult to miss the test of Avangard system from Dombarovskiy on 26 December 2018. This should probably count against the 12 launches in Karakayev statement. Then, it appears that there was some activity at Kapustin Yar. There is fairly strong evidence that the event that took place there in early December 2018 was a failed launch of a Topol-E missile. There is also some evidence that there was a launch of a missile, probably Topol-E, from Kapustin Yar to Sary Shagan in October 2018 - pieces of what looked conspicuously like fragments of a Topol first stage landed in Kazakhstan. Given that it landed outside of the designated areas the launch was probably not a success. Putting it all together, it appears that Russia conducted only two successful ICBM launches in 2018, not 12 announced by Karakayev in December 2017. If we count Nudol, the number of successful launches will be three. Well, maybe the two Sarmat ejection tests were included in the 12 launches as well. 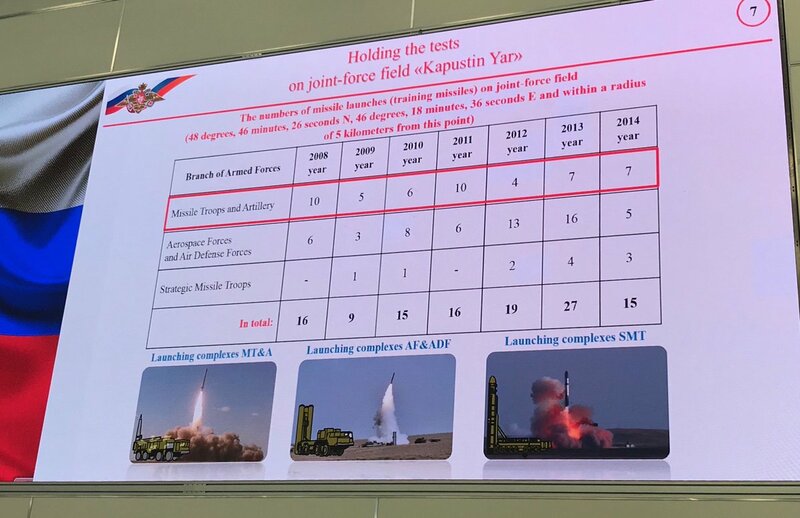 These and the two apparent Kapustin Yar failures would bring the number of Rocket Forces tests to six (Nudol won't be included here), which, in fact, would be more in line with the historical record - the actual number is about half of what is planned. On 26 December 2018 the Strategic Rocket Forces performed a test of the Avangard system that includes a hypersonic glide vehicle carried on a UR-100NUTTH/SS-19 missile. The launch, which took place at 12:59 MSK, was observed from the National Defense Control Center by the President of Russia and other officials. The test was said to be successful. It was also reported that the Avangard system has completed the program of tests and is ready for deployment in 2019. The UR-100NUTTH missile that carried the vehicle was launched from a converted R-36M/SS-18 silo of the Dombarovskiy missile division (the one at 51.030849,59.690144). This silo has been used in earlier tests of the system (referred to as Project 4202). The vehicle reached its target at the Kura test site. According to earlier reports, the deployment of Avangard will begin with two UR-100NUTTH missiles with the glide vehicle of the Avangard system will begin with two missiles deployed at Dombarovskiy by the end of 2019. The history of Avangard/Project 4202 tests is a bit complicated. The vehicle, initially known as Yu-70, was tested four times in the 1990s and then it was mothballed until 2001. It was demonstrated to the Russian leadership in a test in February 2004 after which the development apparently got the green light (even though the test may not have been entirely successful). The next three tests - in December 2011, September 2013, and September 2014 (the evidence is mostly circumstantial for this one) - that involved a Yu-71 vehicle (built without Ukraine's participation) were probably not very successful as well. I was told that the designers had some problems with getting the vehicle to maneuver. This seems to be in agreement with what Yuri Borisov, deputy defense minister, said in a recent interview - the program was almost shut down "four years ago" (which would place it at the end of 2014). However, the designers asked for another chance to prove that the project is viable and they got it. After that decision, there was a known test in February 2015 (probably unsuccessful), and two in 2016 - in April and in October. U.S. intelligence sources were quoted as saying that there was another (unsuccessful) test in October 2017, but this report does not seem very reliable - all 2017 ICBM launches have been accounted for and Borisov said that the most recent test of Avangard was the third one (I assume it was the third successful). 18 Feb 2004 Baykonur Demonstration of the Yu-70/102E vehicle. UR-100NUTTH launch during a strategic exercise. 15A35P launch. Reportedly unsuccessful. In any event, everything appears to be ready for the first two Avangard launchers at Dombarovskiy in 2019. The total of 12 missiles are expected to be deployed there by the end of 2027, which confirms that it's largely a niche capability. There are persistent rumors about Avangard gliders being deployed on Sarmat ICBMs - as many as three on a missile - but I am a bit skeptical about that. P.S. An interesting detail that can be seen at 0:05 on the video of the launch - the opening silo cover has something like a piece of cloth (тряпочка) attached to it. My guess is it's a cover of the missile container that is being removed as the silo opens. But the removal method doesn't seem particularly elegant. P.P.S. The glider is said to have reached speed of 20M or even (according to Borisov) 27M. This sounds impressive (and in fact it is), but we should keep in mind that the vehicle is flying at altitudes of 70-80 km. The speed of sound there is about 290 m/s, which is less than 340 m/s at the sea level (NASA has a nice calculator). So, 20M would be 5.8 km/s (27M is about 7.8 km/s). At 03:20 MSK (00:20 UTC) on December 21, 2018 the Space and Air Defense Forces conducted a successful launch of a Proton-M launcher from Baykonur. The satellite that was successfully delivered into orbit by the Briz-M booster stage, received the official designation Cosmos-2533. Cosmos-2533 is the Blagovest communication satellite (No. 13L) produced at the Reshetnev ISS enterprise in Zheleznogorsk. Previous launch of a satellite of this type, Cosmos-2526, took place in April 2018.